This month is Artist Appreciation Month! Did you know? I wasn’t aware of it until recently, when I learned of if through another artist, Patience Brewster. If you have followed my blog for more than a year, you’ll know that one thing that I enjoy doing is introducing you to other artists. Seeing as this is THE month to celebrate artists, I have to share with you the artists who are delighting, inspiring and influencing me right now. I know when most people talk about being inspired by artists, they talk about techniques and lighting, but my inspiration right now, comes from other areas. Pure imagination and fantasy is what inspires me right now. The artists below, are so good at bringing fantasy to life with exquisite attention to detail. I have enjoyed Patience Brewster’s work for years, from her beautiful fairies to whimsical animals. I love her painting style and the imagination that goes into each and every little detail. I know that you will simply adore her figurine and ornament lines, especially the Christmas Ornaments. My favorites are her reindeer, and especially, this one. I highly encourage you to explore her world and get to know Patience and her art. You’ll be delighted at everything you see. Mayumi Ogihara is a very talented pencil artist who I met through my participation in Enchanted Visions and EM Sketch Fest. Her art is amazing. I particularly love the piece above. The eyes are so soulful. I originally published an interview with Mayumi on this blog, back in October of 2014. You can read it and see more of her art HERE. You will also find links to her galleries, Facebook, etc. there. 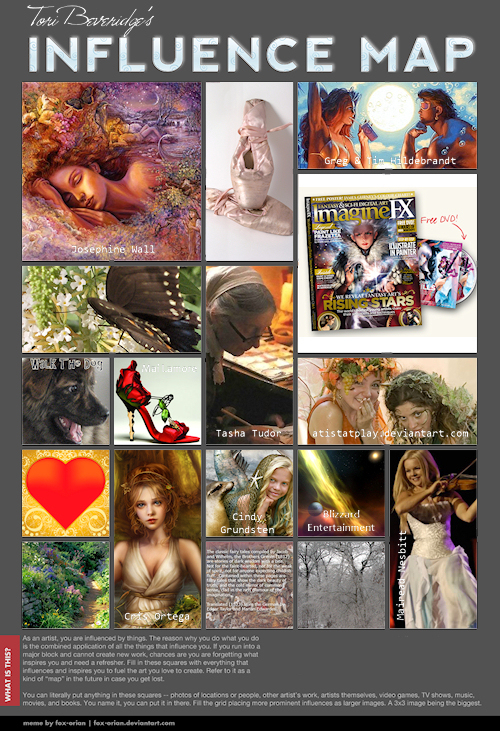 Below is my Artist’s Influence Map that I blogged about, back in 2010. What you see in each of the squares is what and who influenced my art back then. Today these same artists and things continue to inspire me. CLICK HERE to read the original post. Again, CLICK HERE to read my original blog post and learn how each artist and each element in every square inspires and influences my art. Thank you for visiting and reading this post. I hope you’ll enjoy visiting the artists who inspire me and that they will delight and inspire you also. And… to the artists.. thank you! You are amazing and you and your art is so appreciated. Posted in artist feature and tagged artist appreciation month, inspiration.